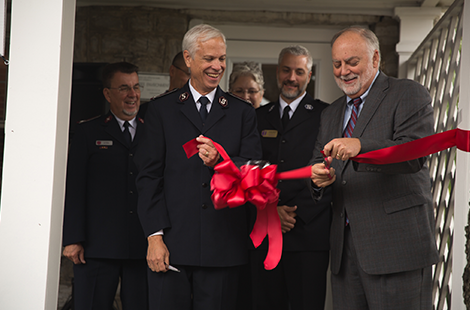 While researchers began their work at The Salvation Army Social Justice Research Center (SRJC) last spring, Trevecca Nazarene University and representatives of The Salvation Army dedicated the center yesterday. Special guests attended a luncheon, followed by a dedication ceremony on the lawn outside of Marks Guest House on Trevecca’s campus, which houses the SRJC. The unique partnership between the University and The Salvation Army is centered on a shared belief in applying biblical social justice in the real world. The work of the SRJC, led by director Lt. Colonel Vern Jewett and staffed by researchers Terri Neville and Curtis Elliot and office manager Lt. Colonel Martha Jewett, is centered on sound research that helps The Salvation Army identify best practices to combat social injustice and give a voice to those who are marginalized. It’s a conviction the University has long shared, reflected in Trevecca’s own J.V. Morsch Center for Social Justice, which is housed in Marks Guest House alongside the SRJC. Neville and Elliot’s SRJC research will be integrated into social justice classes. Neville and Elliot are currently working on two research projects. One is focused on The Salvation Army’s Pathway of Hope program; the other centered on areas of deep poverty in West Virginia. Dr. Dan Boone, Trevecca’s president, spoke briefly at the dedication, stressing his desire that the work of the SRJC will have far-reaching effects. Jamie Casler, director of the J.V. Morsch Center for Social Justice, offered a prayer at the dedication ceremony, followed by a ribbon-cutting ceremony featuring SRJC staff, Bell, and Boone.